BIG CYPRESS — U.S. military veterans were recognized and celebrated during a formal program in Big Cypress on Nov. 10. The Big Cypress community, along with visitors from around Florida, gathered at the Herman L. Osceola Gymnasium to pay their respects to veterans both living and passed. 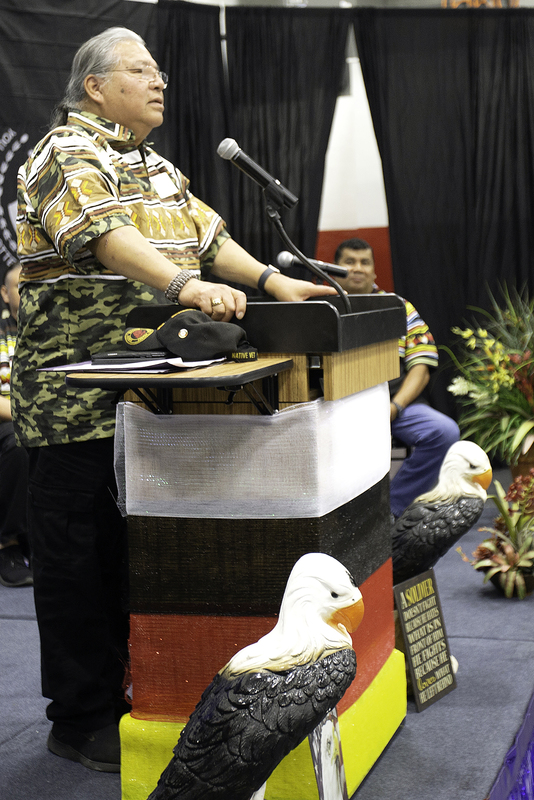 President Mitchell Cypress, a U.S. Army veteran, welcomed Tribal members and guests to the event from a stage that was decorated with flags and other patriotic symbols. 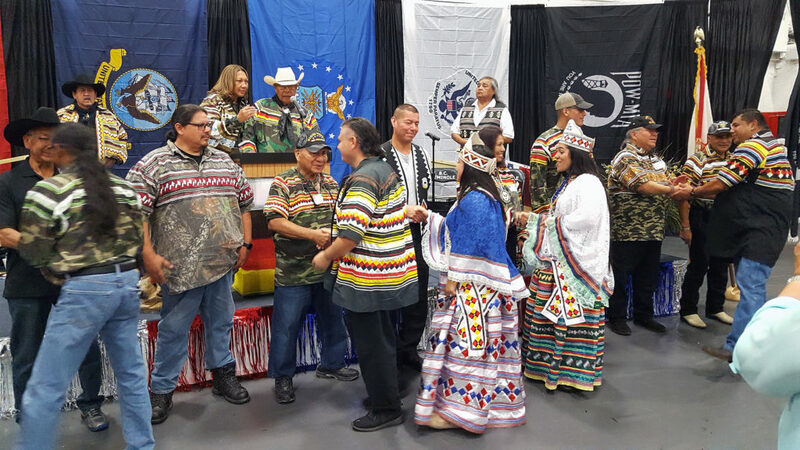 President Cypress was joined on stage by several members of Tribal leadership, including Big Cypress Councilman Manuel Tiger; Big Cypress Board Rep. Joe Frank; Brighton Board Rep. Larry Howard; and Hollywood Board Rep. Gordon Wareham. Miss Florida Seminole Cheyenne Kippenberger and Junior Miss Florida Seminole Allegra Billie were also in attendance and greeted the crowd. “It’s an honor and privilege for me to be standing in front of you. We love our warriors very much. It is eye-opening to see all of you come to this small community,” said Councilman Tiger..
S.R. Tommie was the emcee for the ceremony. She is a member of the Bird Clan and founder and president of Redline Media Group. She noted that Native Americans have served in the U.S. military in greater numbers than any ethnic group since the American Revolutionary War. Tommie called for a moment of silence to honor recently passed veterans Johnny Osceola and Dan Bowers. Tommie also paid tribute to the late Coleman J. Josh who was born and raised in Brighton. Josh was a member of the U.S. Army and served in Vietnam. After his discharge in 1973, he worked in the Seminole Tribe of Florida’s behavioral health department as an adult drug and substance abuse counselor and later an outreach counselor. His family was given a special plaque in his honor at the ceremony. 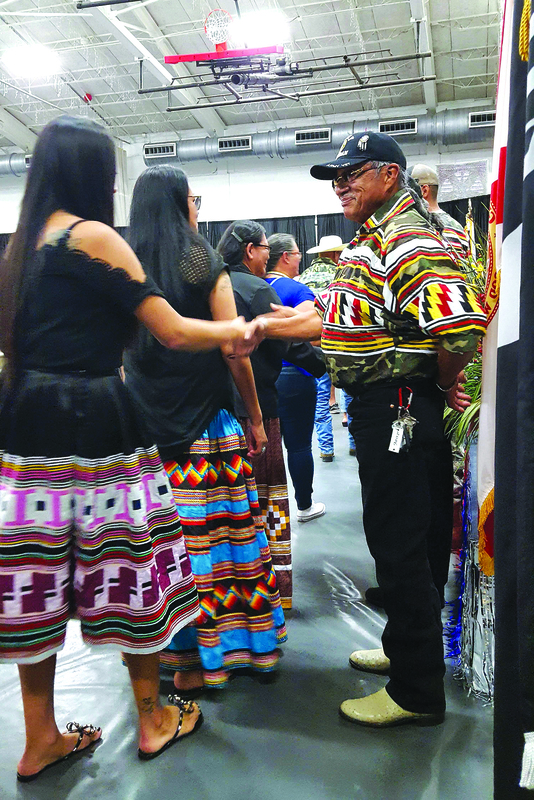 After an invocation by Jonah Cypress, the Seminole Tribe of Florida’s public safety color guard presented the flags to the front of the stage – the Stars and Stripes, Florida State flag and the Seminole Tribe of Florida’s flag. Students from the Ahfachkee School led the crowd in the Pledge of Allegiance, followed by Jean Capricien singing God Bless America and the Star Spangled Banner. 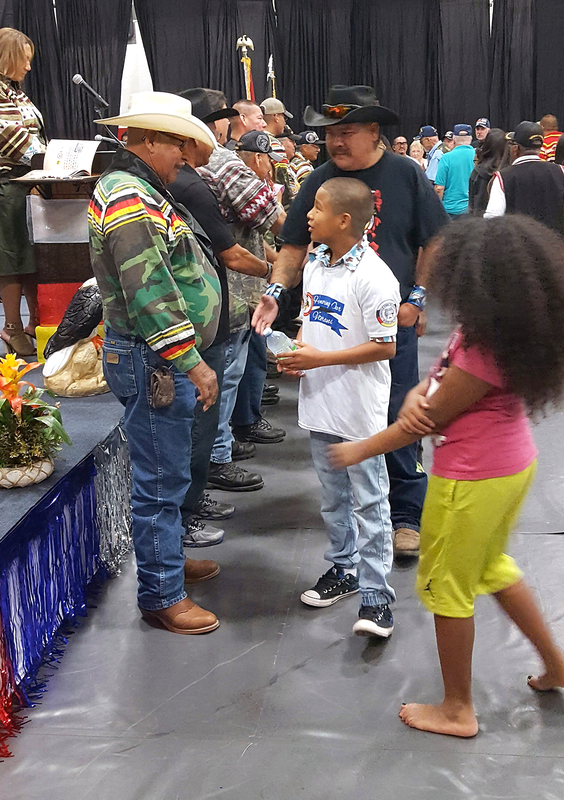 Tommie informed the attendees about the National Native American Veterans Memorial, which is set to be completed in November 2020 in Washington, D.C. Seminole veteran Stephen Bowers was instrumental in bringing the memorial to fruition, after being tasked by President Cypress years ago. It will be the first memorial to honor Native American veterans at the National Mall. Donations toward the project are still being taken, Tommie said.Among a lineup of guest speakers at the event were Pastor LW Howard of the Community Harvest Worship Center in LaBelle, and U.S. Marine Corp. Vietnam veteran Joel M. Frank Sr.
Frank paid tribute to the Marines and to Herman L. Osceola, who the gymnasium is named after. Moses Jumper Jr. then read a poem – “Flag of Our Fathers” – he wrote in honor of veterans as well. “Among our Native people we also have our colors; for which we hold up high; they also serve for freedom, and a way of life; we will never let it die,” part of the poem read. Tommie closed out the veteran recognition portion of the day by inviting Paul Bowers to the stage to call the names of veterans and have those in attendance line up at the front of the stage. Those in attendance then went through the line to greet and thank each veteran who was present. Andrew C. Rosebrough, a graduate of the music program at the Dreyfoos School of the Arts in West Palm Beach, played the bugle call – “taps” – before Jonah Cypress offered a closing prayer. The idea for a Big Cypress veteran’s day celebration began almost 30 years ago when President Cypress had a barbecue with Roy Nash Osceola and Jacob Osceola. The event used to be held at the Big Cypress Field Office, but eventually there wasn’t enough room and a larger venue was needed. It was soon after that the event would be held at the gymnasium.